It is somewhat interesting that 0 deg C was recorded overnight 10th-11th [No. 1] and 17th-18th [No. 2], possibly implying humidity low enough for an impending change or changes (in weather conditions) in the near future (days to a week from said dates). No. 3 zero degrees (23rd-24th). No. 4 minus 2 degrees just gone (24th-25th). Possibly something in the wind (2-3 days). Relative humidity now around 25%, [sfc] pressure having dropped from 1009 to 997 hPa in ~24 hours. Windy this morning, quite calm now. Sitting on/near a trough line by the looks of the latest mean sea level pressure analysis from the BoM. Relative humidity remained around 30% mid-afternoon and is now roughly another 10% higher (was briefly around 50% this morning, possibly associated with the trough mentioned earlier). Sfc. Pressure down to 991-992 hPa. Possibility insect behavioural observations indicative of something coming this Spring. Too early (?) to tell, but noted. Insects as in ants (flying ants) were also visible in at least three locations along the river today. Again, it’s difficult to tell why, but the surface pressure has now dropped significantly from recent values. Today’s max reached 30 degrees…the way the pressure is going, it might drop below 990. Will wait and see . 21 days since the last moderate rainfall event (6th September)…15.7 mm to around 10 am this morning, system total. Flow response was minimal, but it was interesting to see observations unfold regardless . Flow response was minimal, but it was interesting to see observations unfold regardless . Correction: discernible (visual and audible) change in flow apparent early afternoon, reasons unknown. Pressure has risen from 995 to 1022 in 2 days. The surface pressure (today) has peaked 38 hPa above the pressure on the morning of the 28th (~992). It is now around 1026. Streamflow is showing no signs of abating in the last 12-24 hours…in fact, if anything it appears to be increasing. And again, for reasons unknown. Flow steadied in the last 4 days, a little lower. Temperature rose significantly in the same time, somewhat cooler today. 30, 30 and 29 degrees respectively over the last three days. Humidity plummeted to around 19%, 3.30 pm yesterday, currently back another 30 % higher. Possible rainfall event(s) (GFS) noted mid-October. Humidity plummeted to around 19%, 3.30 pm yesterday, currently back another 30 % higher. Just over 60%; pressure adjusted roughly to mean sea-level (PRMSL) now about 1015 hPa @ ~ 5 pm. Temperature 13 degrees C @ ~ 5 pm, conditions become much more conducive to rain; estimated precipitable water increasing towards 20 mm. Humidity currently 57% @ 11.30 am, PRMSL still around 1015 hPa. Temperature around 15 degrees. Estimated precipitable now in excess of 20. Conditions becoming very conducive to rainfall; 0.7 mm overnight, with lightning. Conditions have been in sufficient for facilitating further development. To clarify (from memory): BoM forecast 0 to 4 mm for the 6th, 0.9 mm fell. Recent falls suggest this area of the Onkaparinga Catchment is a good 25-30 mm/day away from a noticeable response to rainfall. Temperature observations from the BoM found here suggest an overnight low of zero recorded 16th-17th (Oct 2012) was not a faulty reading . The correspondingly low humidity of 36% recorded the following day appears to support drawing this conclusion. This may not mean there are significant falls on the way, but it does suggest a change in pattern/humidity is possible. The last falls – which were moderate – fell from the 10th to the 12th; 8 days ago. 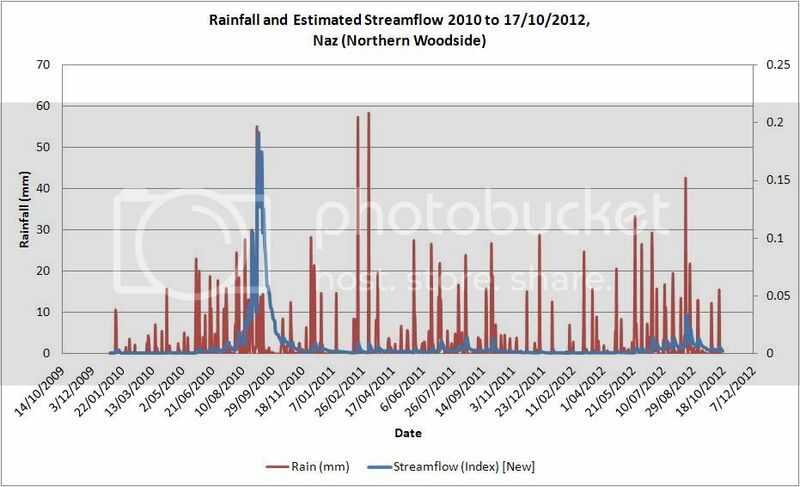 Streamflow has been gradually falling since then. Rainfall, Streamflow Estimates to the 17th since 1-1-2010. 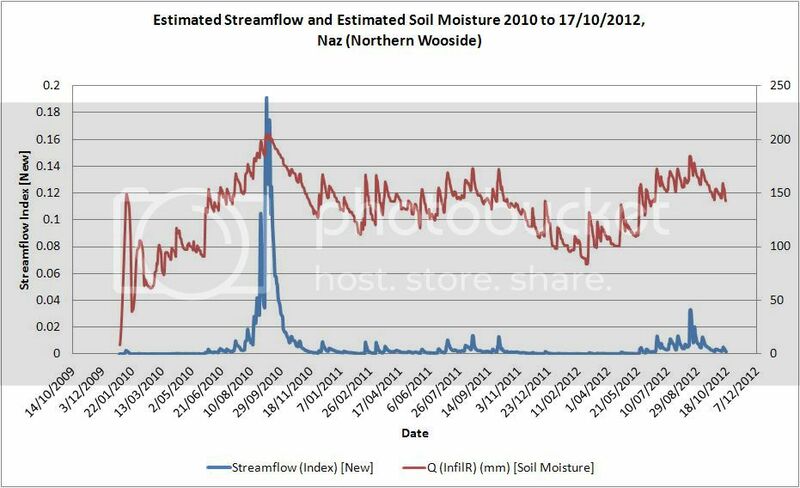 Estimated Streamflow and Soil Moisture for Comparison (Same Period). Temperature observations from the BoM found here suggest an overnight low of zero recorded 16th-17th (Oct 2012) was not a faulty reading . The correspondingly low humidity of 36% recorded the following day appears to support drawing this conclusion. This may not mean there are significant falls on the way, but it does suggest a change in pattern/humidity is possible. I think the change in humidity just went through in the last 24 hours. The first significant change in humidity in a while (25th Oct) did not last. Indications (according to GFS and ACCESS-R) are that precipitable water is going to increase rapidly and substantially in the next 24-48 hours, with possible falls up to ~20-30 mm (BoM) and possibly higher (maybe 45-60 mm GFS). Will see if we get that much rain, but whether it translates into an order magnitude streamflow response is another matter. If we do get what’s forecast, and the local river does respond in a big way, it may mark the start of a shift in patterns of day-time humidity not seen since about June. Precipitable water (in mm) has increased sharply in the last 12-24 hours or so (GFS up to something like 35-40 mm, maybe higher). (Sfc) Pressure has remained sustained @ 992-994 hPa (~1003-1005 hPa MSLP) for several hours to 2-3 pm, with some rather nasty wind gusts. Was 990 hPa (~1002 hPa MSLP) ~ 5 pm, increasing the probability of significant falls (and with it significant change in runoff). Update Note: Latest GFS forecast has just a little worry about it (for next few hours or so). Potentially something in the air...fair way out, but interesting. See 28-day Weatherzone Forecast. Statistically, reliable rainfall in the November-to-December period and even into late December is possible ; reliable as in not the same pattern all the time, but more often than not. As present, there have been (not including today) 41 days without a significant (noticeable) change in run-off. Although the surface barometric pressure dropped yesterday to about 998 hPa, the result (0.5 mm with a brief thunderstorm) had little or no noticeable effect on this continuing. Notably the pressure dropped below 1000 hPa (per event) 3 times in the last 41 days – 998 on the 24th of October and down to about 990 on the 5th of this month; the outcomes (with precipitable water values estimated at about 24.3 mm and 27.6 mm respectively) were little more than a trace of rain. Corresponding day-time vapour pressures (per event) were about 44 and 49% relative humidity (as opposed to something like 70-80% at night). Estimated night-time diurnal ranges (for the same period) for humidity seems to suggest a higher probability of night-time rainfall, or from late evening onwards, however this also depends on how much solar heating during the day (leading evaporation and transpiration) facilitates greater moisture content. Precipitable water (PWAT) (a function of humidity and pressure) tells us about how many millimetres of water would be present on the surface, per square metre, if the entire water-vapour column in the troposphere condensed out. Therefore higher PWAT could imply a higher probability of rainfall if the barometric pressure falls enough (the humidity remaining steady). If the barometric pressure falls and the humidity increases, the density will increase due to the additional water vapour content (ideal gas law P = p*R*T), meaning the temperature will fall being inversely related to the density. The day-time humidity here has not been increasing, it’s been decreasing. Going into summer, the barometric pressure is on a steady decline, on the odd occasion declining a little further with rain events, cool changes or troughs. Therefore with the humidity falling, the pressure is down, PWAT down, day-time temperatures up (sensible heat), and the nighttime temperature down (less moisture to retain heat overnight). The consequence – more often: a greater diurnal variation (temperature), generally low humidity, low-to-moderated barometric pressure, and thus less in the way of runoff. At the moment it seems the event(s) forecast for later this month (near the 29th I think it is) across Southern Australia (and possibly through the centre) may come about due to a change in the PWAT, exceeding perhaps 35 mm. A change (increase) in this variable with humidity decreasing beforehand seems to me to imply a change in the pressure – up – after a change in moisture levels occurs. “on the odd occasion [the pressure] declining a little further with rain events, cool changes or troughs”. Just a brief note: surface pressure as been between approx. 996 to 994 hPa since ~26th, meaning relatively speaking we seem to be in appreciable trough-like conditions, with overnight lows 10-15 deg (maxing in the 30-35 deg range). The humidity has not been impacted just yet, but I suspect it might be soon. Going by recent GFS (AVN) forecast...flooding in the mid-north (SA)!? Generated in 0.023 seconds in which 0.008 seconds were spent on a total of 14 queries. Zlib compression disabled.